Drew Karpyshyn's Darth Bane novels have been a surprise runaway success for the Star Wars franchise. I loved the first book Darth Bane: Path of Destruction (read my review here) and I thought that Darth Bane: Rule of Two was a considerably good follow-up, particularly when you bear in mind that Karpyshyn was operating under a much tighter deadline than usual. This December will come his third novel in the series. 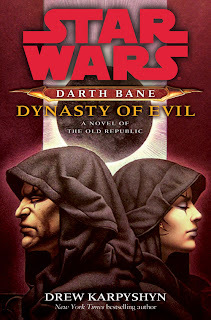 Darth Bane: Dynasty of Evil is set to continue the chronicles of the man who re-established the Sith Order and instigated the Rule of Two that carried on down to the days of Darth Sidious and Darth Vader. StarWars.com just released the cover of the book, featuring Bane and his apprentice Darth Zannah.